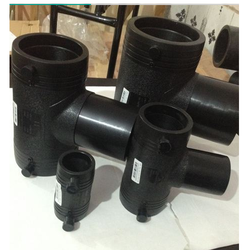 Application: Gas Pipe, water supply pipe, chemical handling, sewage. We are leading supplier of PE Electrofusion Fittings. Fittings is customized as per the specifications of our clients. These fittings are widely appreciated by the clients as they are able to withstand high pressure as compare to the other fittings available in the market. Offered at industry leading price, our range of Electro Fusion Fittings is customized as per the specifications of our clients. These fittings are widely appreciated by the clients as they are able to withstand high pressure as compare to the other fittings available in the market. We offer wide range of Electro Fusion Fittings to our clients. 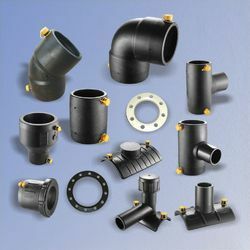 These Electro Fusion Fittings are available at industrial leading price. These Electro Fusion Fittings are widely available in various dimensions and specifications. The Electro Fusion Fittings offered by us are available upto 630 mm CD Size mainly used for Gas Application Fusion Joint. Its reliability is very high. These electro fusion fittings find its application in various industries. We offer a wide range of Electrofusion Fittings.